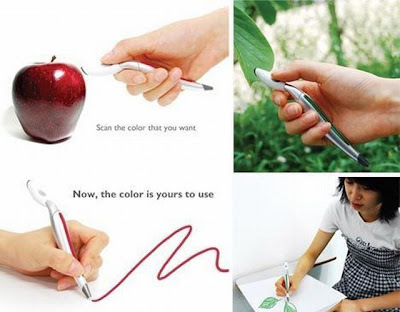 This is an actual product, a pen called the Color Picker by Jinsun Park (Korean, I'd guess with that name). It really does let you scan colors and write with them, possibly using tech I thought should be used a few years ago (put a printer head on the pen rather than an ink cartridge). How long the ink lasts, how long the batteries last, and how expensive it is to replace the ink is unsure, I'm guessing the pen costs hundreds of dollars. But wow, would that be interesting to use.